Diversity score. To create this statistic, we looked at the population percentage of different racial and ethnic groups in each city. A lower number represents more diversity. Data comes from the U.S. Census Bureau’s 2016 1-year American Community Survey. Economic mobility. This metric looks at generational change in economic position for families. A higher number shows greater mobility. Data comes from The Equality of Opportunity Project. Homeownership rate. This is the percent of households who own their home. Data comes from the Census Bureau’s 2016 1-year American Community Survey. Home value. 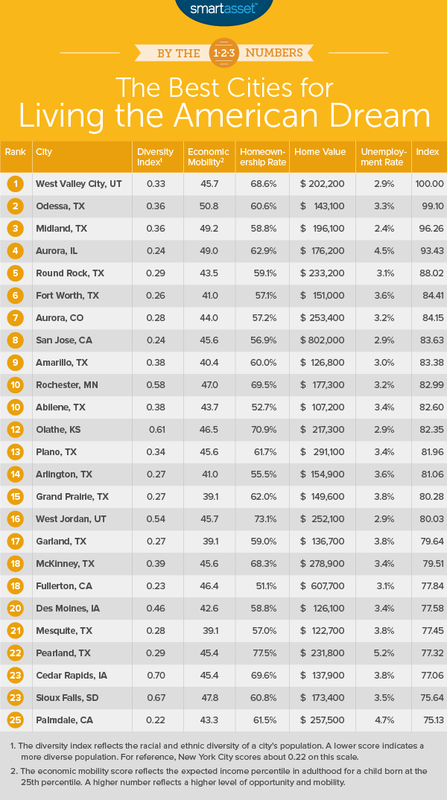 This is the median home value in every city. For this study, a lower home value is considered better as we use it as a measure of affordability. Data comes from the Census Bureau’s 1-year American Community Survey. Unemployment rate. This is the unemployment rate by county. Data comes from the Bureau of Labor Statistics and is for January 2018. The five measures seem to make sense. You could quibble with different aspects, such as measuring the unemployment rate at the county level rather than the city or metropolitan region. What would make sense to add to this list of five measures? There is no measure of educational achievement on this list and it might be interesting to consider the foreign-born population in each place (particularly since the foreign-born population is at a high in American history). Do lower taxes matter? The list is skewed away from two areas: (a) the East and West coasts and (b) the biggest American cities. I would imagine the coastal cities have difficulty with home values. However, it is less obvious to me why the biggest cities, particularly those in the South and Midwest, do not make the top of these rankings. This entry was posted in Sociology and tagged American Dream, cities, rankings, social mobility. Bookmark the permalink.